Fuel ethanol production capacity in the United States reached more than 16 billion gallons per year, or 1.06 million barrels per day (b/d), at the beginning of 2018, according to EIA's most recent U.S. Fuel Ethanol Plant Production Capacity report. Total listed, or nameplate capacity, of operable ethanol plants increased by 5%—more than 700 million gallons per year—between January 2017 and January 2018. The U.S. Fuel Ethanol Plant Production Capacity report shows EIA’s most up-to-date data tracking of the U.S fuel ethanol industry. Part of the increase in nameplate fuel ethanol production capacity in the most recent report is the result of EIA’s outreach to survey respondents that were operating at levels higher than their listed production capacities, which had resulted in utilization rates higher than 100%. In previous surveys, these respondents reported the facilities’ original design capacity values and may not have accounted for expansions and modifications at the plants. This year, some respondents increased their nameplate production capacity values to be consistent with EIA’s definition. The remaining increase in production capacity was a result of plant improvements and process modifications such as equipment upgrades, plant expansions, improved maintenance routines, and installation of new equipment at some facilities. 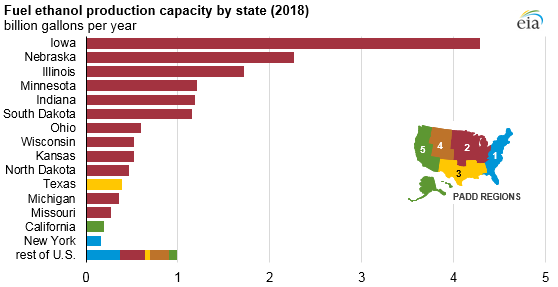 Most of the U.S. fuel ethanol production capacity is located in the Midwest region (as defined by Petroleum Administration for Defense District, or PADD, 2). Total nameplate capacity in the Midwest was 14.8 billion gallons per year at the beginning of 2018 (967,000 b/d), an increase of 5%—more than 650 million gallons per year—between January 2017 and January 2018. Of the top 13 fuel ethanol-producing states, 12 are located in the Midwest. The top three states—Iowa, Nebraska, and Illinois—contain more than half of the nation’s total ethanol production capacity. Actual U.S. production of fuel ethanol reached a total of 15.8 billion gallons (1.03 million b/d) in 2017. In EIA's June Short-Term Energy Outlook (STEO), U.S. production of fuel ethanol was forecast to reach 15.9 billion gallons (1.04 million b/d) in 2018, resulting in 98% utilization of reported nameplate capacity as of January 1, 2018.